Detect some user input or interaction in the browser. Make a background HTTP call to the server, while letting the site visitor know something is happening. A route—a path with a handler method or class—for Drupal to manage incoming Ajax requests. A form (or maybe some links or other buttons) for the site visitor to click on. When a user fills in the existing form at /tutorial/form, send the data to the server for "validation". Show a spinner while waiting for the server to respond. When the response returns, alert the user, then submit the form anyway. 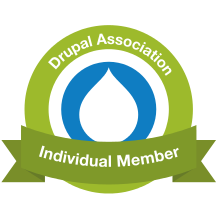 As we'll see, Drupal gives us a comprehensive toolkit with which to accomplish this. An Ajax request, made as part of some existing form, uses the same path as the form but with some query parameters. If you use some kind of browser debugger tool, you might see the example below making requests to a URL like /tutorial/form?ajax_form=1&_wrapper_format=drupal_ajax. This tells Drupal to invoke the form to handle the request, but then switch to a different configured class and method to specifically handle it as Ajax. Which class and method (yet to be written) will respond to the Ajax call. This could involve any class, but for simplicity's sake we're going to add a new method to the existing TutorialForm class. What hint should be given to the site visitor that an Ajax call is in progress. Here we specify the throbber (we'll see it in action below) but no other message. To match our configuration above, we need to add a respondToAjax() method to the TutorialForm class. Pop up a native browser alert box with the submitted user input in it. Change the internal build ID of the form. Forms are given a unique build ID by Drupal, but if your Ajax call might be modifying the form, it's good practice to change this build ID. 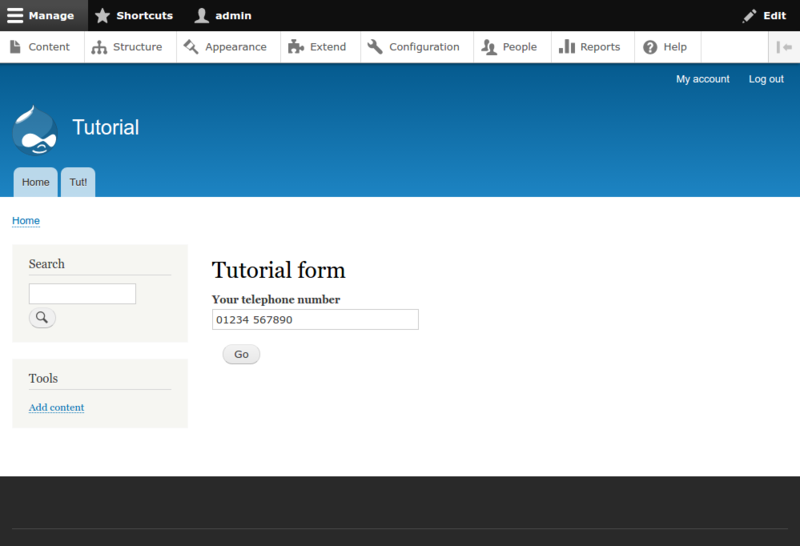 Submit the form, referencing the new build ID in order to find the form in the browser. * AJAX response: alert contents of input field, update form and save it. *   Form API array structure. Arguably, you might not want to submit forms on the site visitor's behalf—it might not be best practice in some situations—but this is only meant to serve as an example. If you can see all this, then congratulations! 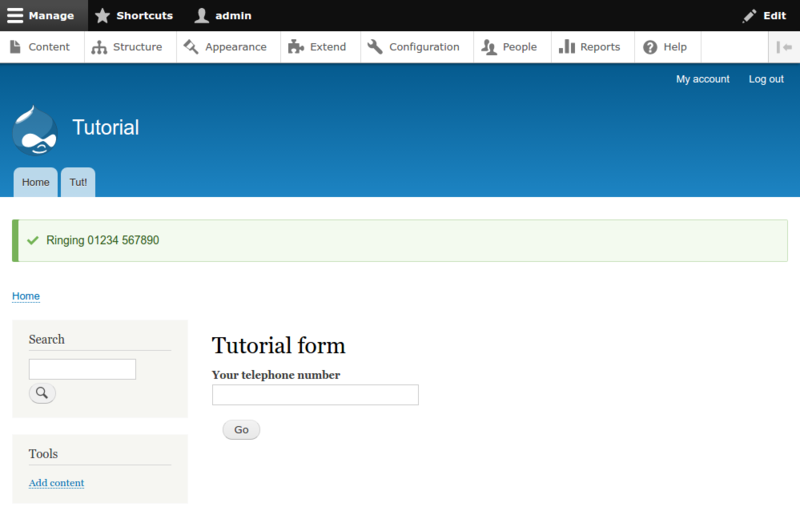 you have successfully added Ajax to a form in Drupal. 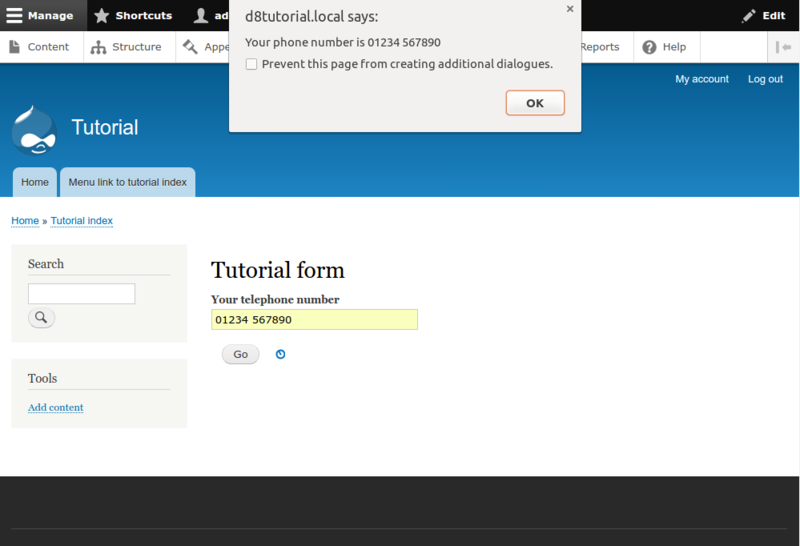 I need to know how to add a new field in that form via Drupal 8 Ajax submission. Adding the markup for a new input field in Ajax is fairly trivial (as you can see, the callback can make use of arbitrary jQuery methods). But your server-side form API array must also react to the new field, so that when you submit it, Drupal will be able to make sense of the new input field (it will normally just disregard it.) You could also encounter problems with form cache, because sometimes Drupal gets form API arrays from its cache (which won't include your new element) rather than modified for Ajax. How to work around this means adding hack upon hack to get it right! I don't think it's changed much since Drupal 8 (confusingly, Drupal 8 does have a State API, which is something different!) so you should be OK with those resources. Hope this helps, and apologies for not quite answering your original question. Keep up the great work. I am learning bunch. Thanks! thanks for this and your other comment. I really appreciate the feedback. You're right that these statements are missing. To give you the background, I did a lot of coding work up front, as a kind of expedition, to make sure I really could make enough progress to warrant the blogposts. Because so much was then tied together in the same codebase, it ended up tough to split it up so that: the forms blogpost had what was relevant there; and the Ajax blogpost has what's relevant here. Clearly there's been a slip 'twixt cup and lip! Future posts should be a bit easier to isolate and hence less likely to lose details. Thanks for the compliment too. I'm glad you're getting something out of these. I also really appreciate people trying out the worked examples, taking them seriously enough to be able to spot bugs like this. The worked examples have to work or there's no point! i need to know how to do core php jquery ajax in drupal 8 ?